We stand with the people of Egypt in their demand for freedom and basic rights, an end to the crackdown, and for immediate democratic reform. We call on our governments to join us in our solidarity with the Egyptian people. Already signed and want to do more? Scroll down to see more ways to help, and spread the word! 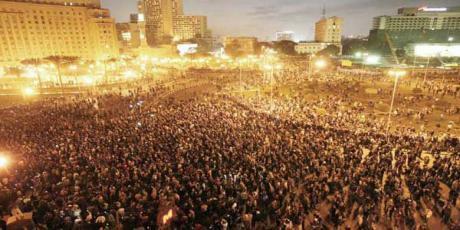 The demonstrations in Egypt could end three decades of repressive rule. The morale and the staying power of the Egyptian people, in the face of all manner of threats, attacks, and public relations tricks, will determine the outcome. Let's support and encourage their struggle by letting them know they're not alone. Avaaz will work with broadcasters whose signals reach inside Egypt to circulate the number of signatures on this statement of solidarity, along with messages of support from around the world for Egypt's people. Every hour matters. Sign the statement of solidarity--and spread the word about this campaign! 2. If you've spread the word, click here to call your leaders to demand they too stand with the Egyptian people. 3. Click here to donate to bring satellite internet to Egyptian organisers.